You gain X life and draw X cards. 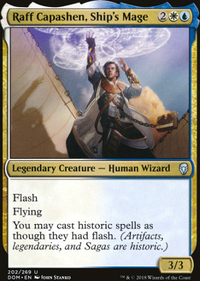 Hello, I am also trying to make a deck with Raff Capashen, Ship's Mage Raff. So far I have been looking into some drawing options. 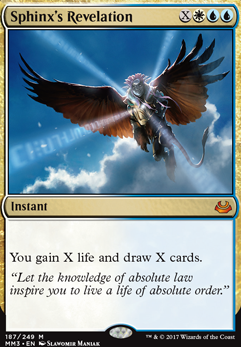 I think instants that draw you cards are usually best suited to the playstile of the deck, kind of like Pull from Tomorrow , Sphinx's Revelation , Frantic Search and Catalog . You can cast them before your turn if your opponents did not make you cast anything or you can play them earlier in the game to improve your options. 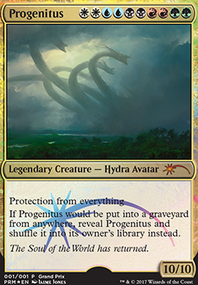 I personally think that in order to make a contrl deck successful in modern, you really need walkers and creature lands for wincons. 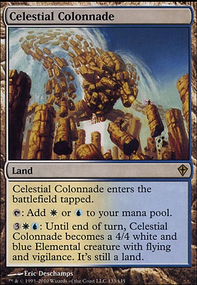 Celestial Colonnade isn't too expensive anymore and I would suggest picking up at least 2. Wandering Fumarole is cheap and could be ran as a singleton. 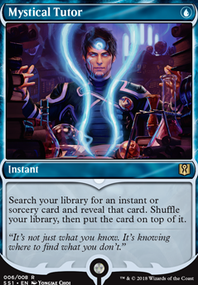 As for walkers, Jace, Unraveler of Secrets is a decent placeholder for the best Jace. Ajani Vengeant could be another walker you can utilize. As for some of your spells, I would remove Think Twice and Hieroglyphic Illumination for 4x Serum Visions and 1x Sphinx's Revelation . Disolve isn't very good either, but modern did just get Absorb and it can help vs burn/aggro. 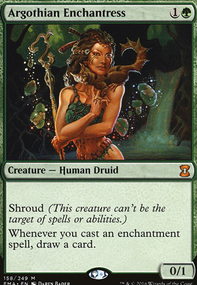 Condemn is also a very good removal card to run with Path to Exile. I hope some of these suggestions help you out! Good luck in your future endeavors! Hello All! I have a foil MM17 Scalding Tarn . The card is NM and pictures are available upon request. I'm looking to trade it for a non foil Zendikar Scalding tarn. This must be included into the trade. Also I have other cards I am looking to swap editions for. 2x Hallowed Fountain RNA and am looking for 2x DIS editions. 2x Steam Vents RTR and am lookin for 2x GPT versions. 1x Sacred Foundry RNA and am looking for 1x RAV edition. 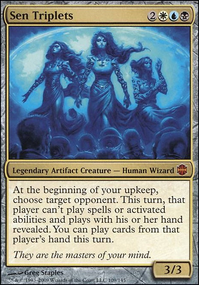 4x Cryptic Command MM15 and am looking for 4x lorwyn editions. 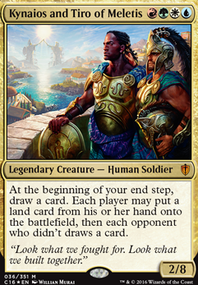 I removed Riddleform and replaced it with Sphinx's Revelation and Mission Briefing which is very versatile in play. If I do remove the creatures, what would you suggest for replacements? I only have 6 creatures at present, and it doesn't feel like a reliable win con. I'm not good at deck building, but I really wanted to experiment with Narset Transcendent . This looks like a pretty cool budget deck, however, you may want to take out the Pteramander and Thing in the Ice Flip as well as Riddleform , as most control decks don't want to cast spells during their main phase. For new cards, maybe one Sphinx's Revelation ? I know it's expensive, but it's a great card. I'm a real fan of Clockspinning as it's a reusable was to spam tokens onto our lands, or remove essential tokens from threats. Sphinx's Revelation , although colour intensive, has done me plenty of good. I wouldn't call it essential tech, like View from Above , but it's strong.